Treat your wedding guests to a selection of enticing Thai canapés when they arrive to celebrate your special day. Thai food is well known across the world for its unique blend of sweet, spicy, sour and salty flavours. From tangy soups to steaming noodles – you can’t go wrong with Thai cuisine. If you are planning on getting married in Thailand, why not treat your guests to an array of distictive appetizers as they arrive at your wedding celebration? Not only will this give them something delicious to nibble on, but it will keep their hunger at bay until the Thai feast you have planned. Whether you serve your appetizers buffet style, or have professional waiting staff patrolling with trays, the selection of Thai favourites below is sure to please. Ask your wedding planner to add them to the menu. If you wander out onto the streets of any Thai town or city, you will notice that chicken or pork satays are among the most popular snacks on offer at street food stalls. If your guests enjoy meat, then this is an ideal appetizer for your wedding day. 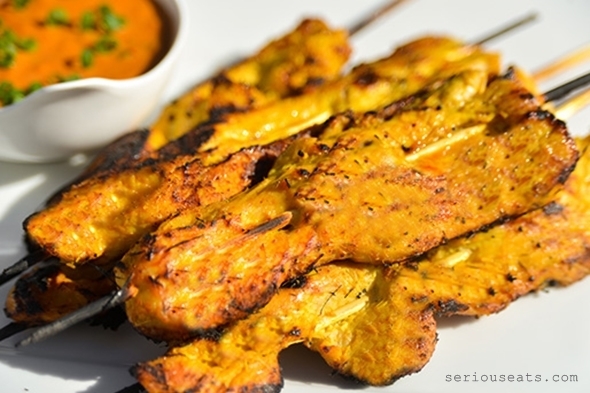 Marinated overnight in garlic, coconut milk and spicy curry paste, the skewers are then grilled on the barbecue until they are succulent and oozing with flavour - the perfect choice for nibbles around the pool of your private villa. While prawn skewers may not be as popular as chicken and pork satays when it comes to Thai street food, it seems a shame to miss out on the delectable, crunchy flavour of juicy prawns when you are so close to the sea. Islands like Phuket and Koh Samui are particularly famed for their wonderful fresh seafood, and it is likely that once your guests get a taste, they will be licking their lips in anticipation of the main meal later on. 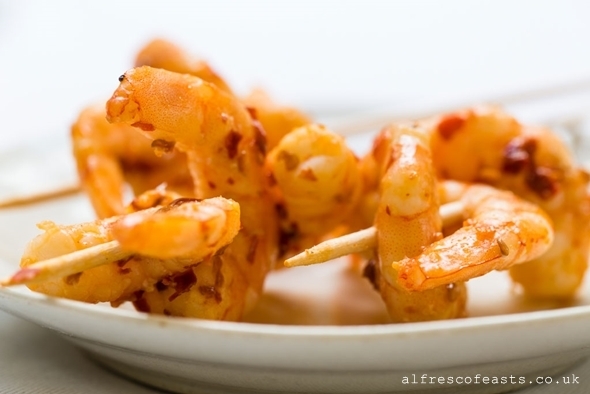 Thai-style prawns are simply marinated in chilli and garlic before being barbecued and skewered. If you a fan of traditional Pad Thai (fried noodles seasoned with lime, brown sugar and fish sauce) then you will love Pad Thai popcorn. 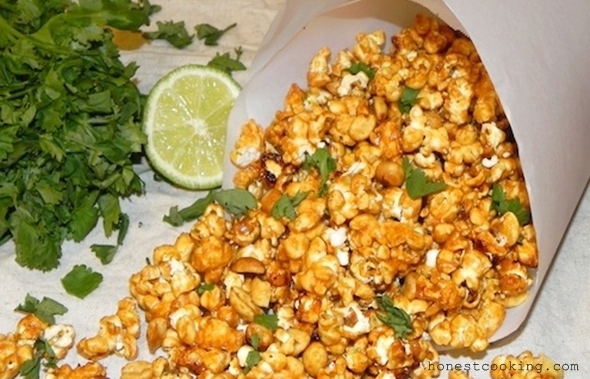 All you need is un-popped corn kernels, lime, peanuts, fish sauce, brown sugar and vegetable oil. Firstly, pop your popcorn as you normally would – in the microwave. Then heat a minuscule amount of vegetable oil in a wok before adding your fish sauce, lime juice and brown sugar. The mixture is sautéed, and then the popcorn is added and served into paper cones. Season with coriander and peanuts for an additional Thai twist. 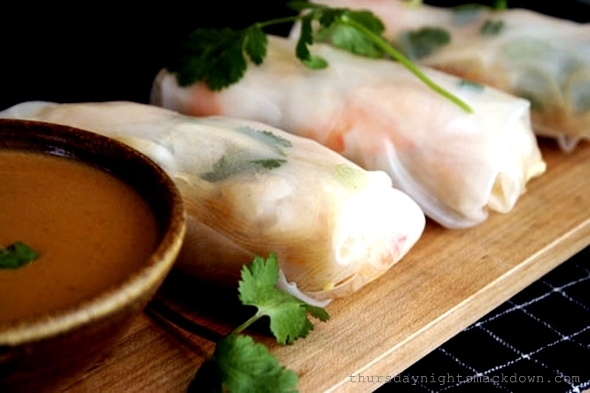 If don’t eat meat, or don’t fancy fried food, then Thai summer rolls are a lighter choice. The filling comprises a selection of vegetables and herbs, including carrot, cucumber and coriander, mixed with chilli paste and rice noodles before being stuffed into round rice paper wrappers. Unlike fried spring rolls, these tempting treats offer a less oily alternative for guests who don’t want to fill up too much in advance of the main meal later on. 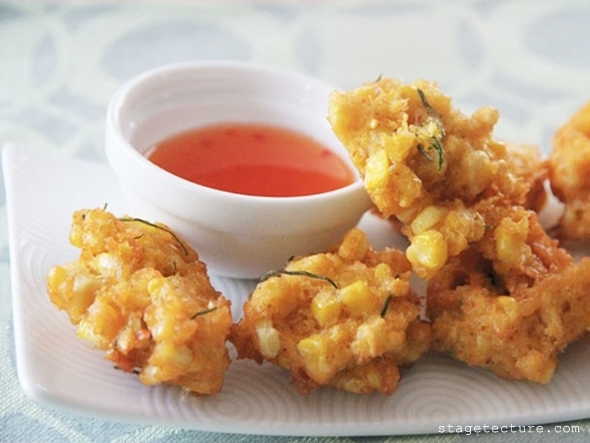 Serve with chilli dipping sauce for best results. This satisfying canapé is ideal for guests who are in the mood for something a little more substantial. Fresh corn cobs are used for the filling and fried in a spicy batter made of rice flour, egg, and curry paste. To give the canapé some extra crunch, and more of a wow factor, you an have them served on mini lettuce leaves with a sprig of coriander on top to inject some colour.